Following the return of Velázquez from his first visit to Italy, by early 1631, it was time to get on with his court duties. Over the next fifteen years, he and his workshop produced a great many portraits, of Philip IV, his relatives and aides, of court jesters and royal children, standing and mounted on horseback. He also painted some other subjects, which I will focus on here. Over the first part of this period in Velázquez’s career, he was greatly involved in the completion of the new royal palace in Madrid, the Buen Retiro, whose decoration was being finished in 1635. This was a project which had first been proposed by Count-Duke Olivares, and involved selecting paintings from other palaces and deciding where best to display them – a delicate task to meet royal satisfaction. Diego Velázquez (1599–1660), Temptation of Saint Thomas Aquinas (1631-32) , oil on canvas, 244 x 203 cm, Museo Diocesano de Arte Sacro de Orihuela, Orihuela, Spain. Wikimedia Commons. 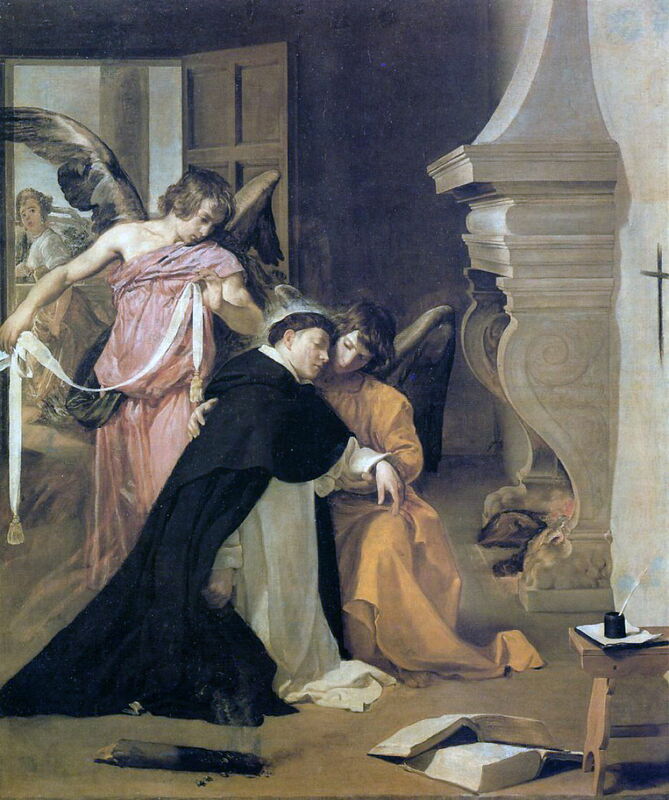 Temptation of Saint Thomas Aquinas from 1631-32 shows a popular legendary episode in the saint’s life. According to contemporary accounts, the saint’s family wanted him to withdraw from the Dominican Order, so he was abducted and brought home, where his brothers sent a woman to his room in a bid to tempt him to break his vow of chastity. Thomas responded by taking a burning log from the fire, drawing the sign of the cross with it, and chasing the woman away. He then fell into a deep sleep, during which two angels visited him and secured a belt around his waist as a sign of his chastity. Velázquez’s painting is a skilfully-composed composite of the story. Outside on the balcony (at the left), the woman is still in flight. The fire is burning, and at the right edge is the sign of the cross in charcoal, with the smouldering log in the foreground. The saint is unconscious, supported by one angel as the other (standing) is preparing to tie the belt around him. One feature attributed to his recent visit to Italy is his precisely drawn and projected fireplace and chimney, which is unique among his surviving works. As visual narrative, it is one of his finest paintings, and a match for those of Rubens. Diego Velázquez (1599–1660), The Surrender of Breda, or The Lances (c 1634-35) , oil on canvas, 307 x 367 cm, Museo Nacional del Prado, Madrid, Spain. Wikimedia Commons. 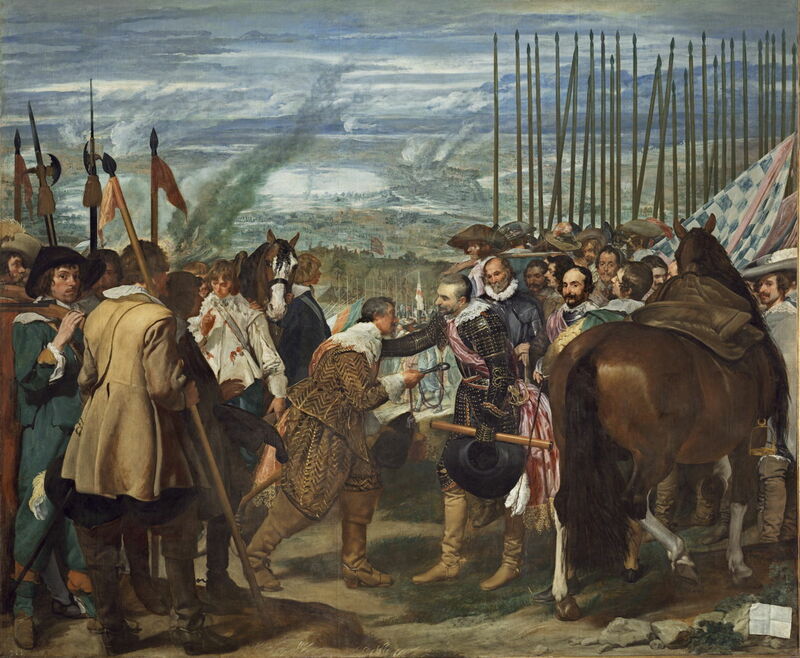 The Surrender of Breda, or The Lances from about 1634-35 was one of the history paintings destined for the Buen Retiro, and shows Ambrosio Spinola, the Spanish general, receiving the keys to the fortress of Breda from the defeated Justinus of Nassau. This marked the conclusion of the siege which had started in August 1624, this moment of surrender not occurring until 5 June the following year. None of the contemporary historical records refer to this ceremonial event, though, which was almost certainly a convenient fiction for the purpose of this painting. Velázquez’s painting of this scene may appear conventional, and similar to other historical paintings of the time. The generals form the centre foreground, their senior staff behind, and the battlefield drops away into the distance. Apart from the unfortunate attention given to a horse’s hindquarters, Velázquez has painted a fine group portrait of Spinola’s senior staff, and a superb landscape and sky. The lances are reminiscent of Paolo Uccello’s famous Battle of San Romano (c 1435-60), which he may have seen when in Italy. 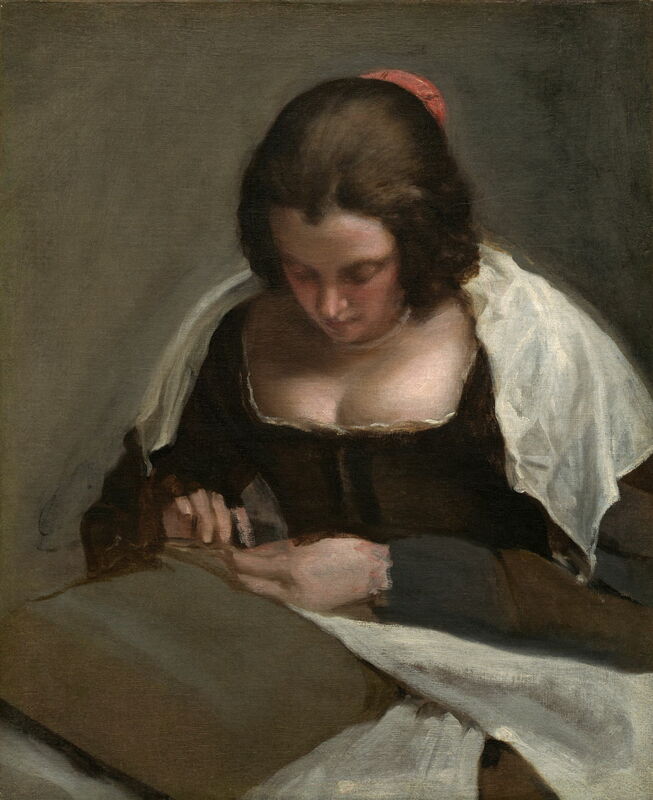 Diego Velázquez (1599–1660), The Needlewoman (c 1635-43) , oil on canvas, 74 × 60 cm, National Gallery of Art, Washington, DC. Wikimedia Commons. Velázquez’s The Needlewoman from about 1635-43 is one of his few surviving unfinished paintings, and one of a small group of his works which portray apparently ordinary people engaged in everyday activities. 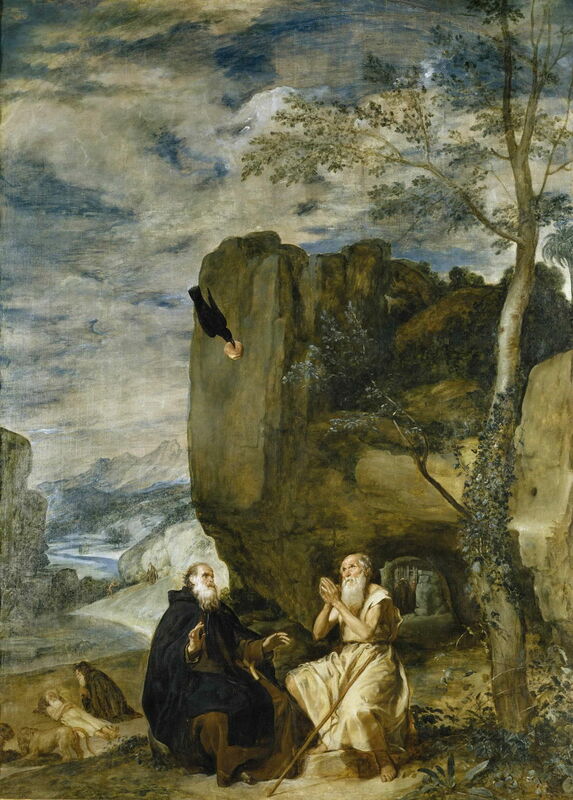 Diego Velázquez (1599–1660), Saint Anthony Abbot and Saint Paul the Hermit (c 1635-38) , oil on canvas, 261 x 192.5 cm, Museo Nacional del Prado, Madrid, Spain. Wikimedia Commons. There were several small chapels in the grounds of the Buen Retiro, among them one dedicated to Saint Paul the Hermit. In about 1635-38, Velázquez painted for its altarpiece Saint Anthony Abbot and Saint Paul the Hermit. This relies on the account given in the Golden Legend of Saint Anthony seeking the advice of Saint Paul. Unusually, Velázquez depicts this using multiplex narrative: in the distance, Saint Anthony is seen asking a centaur for directions. Nearer, he is seen again asking a satyr. The saint is shown a third time in the foreground, sat with Saint Paul as a crow brings them bread from heaven. Saint Anthony then leaves Saint Paul’s cave (seen deep under the rock to the right), but later sees Saint Paul’s spirit being carried up to heaven. He returns, where he finds two lions preparing to bury the saint’s body (lower left). Although the central figures in the foreground are painted quite tightly, much of the rest of this work is amazingly loose and painterly. In 1636, the king decided to enlarge his hunting lodge at El Pardo, near Madrid, known as the Torre de la Parada. Once again, Velázquez was heavily involved in choosing and making paintings for it. Those painted for this purpose include three life-size full-length portraits, and three matching portraits ‘from antiquity’, of Aesop (fables), Menippus (philosopher), and Mars, the god of war. 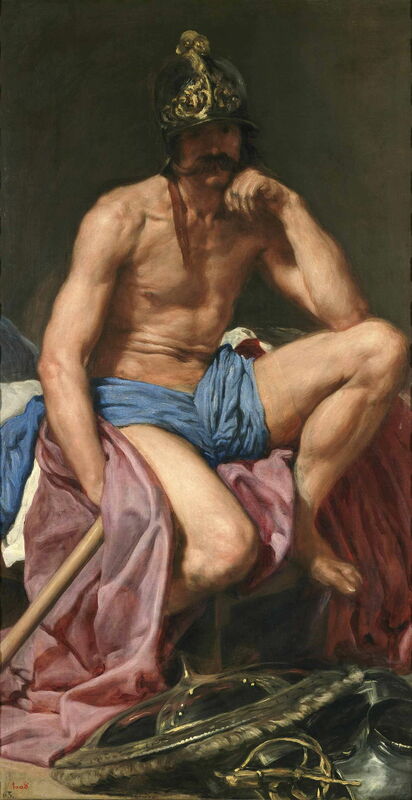 Diego Velázquez (1599–1660), Mars (c 1639-41) , oil on canvas, 179 x 95 cm, Museo Nacional del Prado, Madrid, Spain. Wikimedia Commons. Velázquez’s portrait of Mars from about 1639-41 is highly inventive. Sometimes known as Mars Resting, the god is shown off-guard in a moment of relaxation, his armour and shield dumped on the floor, and wearing just a loincloth and helmet. He looks like he just got out of bed after a long siesta. Although they may seem almost opposites, my last two paintings are actually closely related, and may even share a common model. Diego Velázquez (1599–1660), The Coronation of the Virgin (c 1645) , oil on canvas, 178.5 x 134.5 cm, Museo Nacional del Prado, Madrid, Spain. Wikimedia Commons. 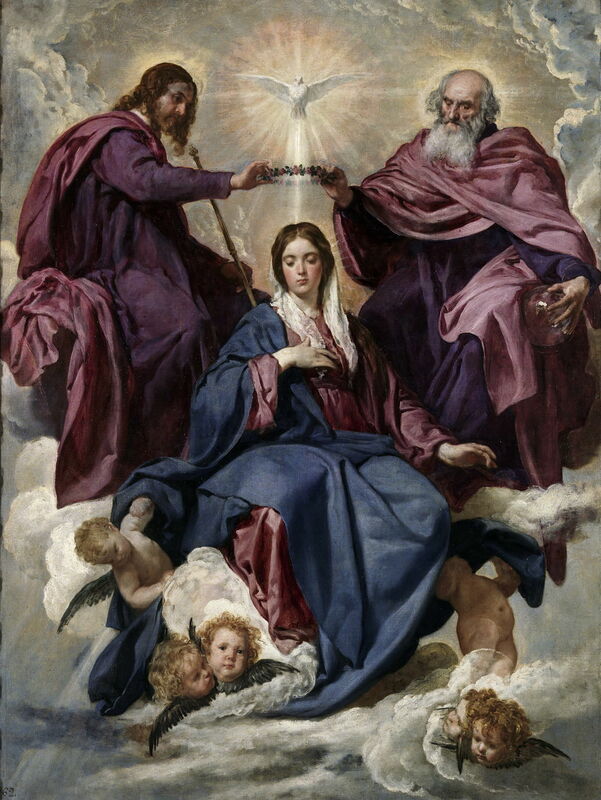 The Coronation of the Virgin from about 1645 is in amazingly good condition for its age, and has neither been relined nor retouched, allowing us to see the artist’s original work throughout. It is the sole survivor of a series of ten paintings of the feasts of the Virgin Mary which were in the Queen’s Chapel of the Alcázar of Madrid when it was destroyed by fire on Christmas Eve, 1734, and is generally believed to have been the last religious painting by Velázquez. The other nine paintings in the series were by Vaccaro, and Velázquez was commissioned to paint this tenth to complete the set. He was therefore constrained to make it fit in with the rest, and used this traditional composition and style. Being a royal commission, he used finest ultramarine for the conventional blue cloak of the Virgin Mary. 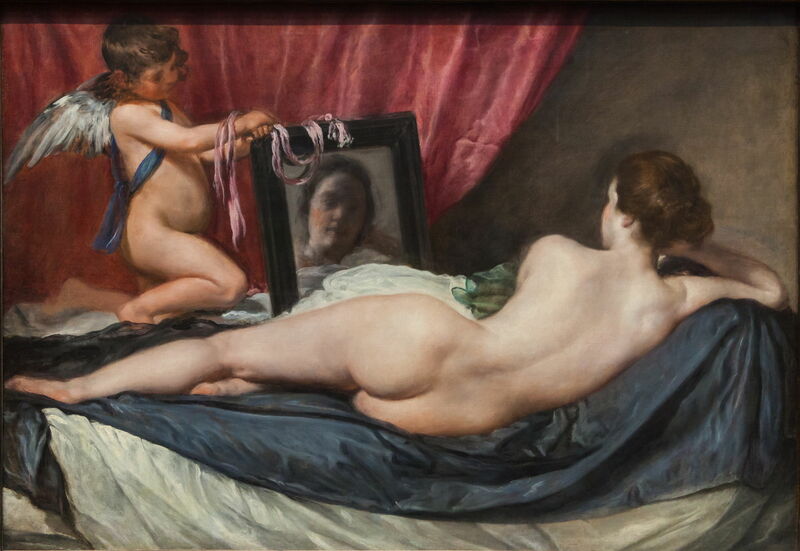 Venus at Her Mirror, also known as The Toilet of Venus or the Rokeby Venus, is probably Velázquez’s most famous and controversial painting. Often claimed to have been painted when he was in Italy during a second visit, documentary evidence that it was in Madrid in 1651 makes it most probable that it was painted in the period prior to that visit, 1644-48. In the mid 1960s, it was the subject of extensive conservation work which has been heavily criticised by some for its effects on the painting. It is an unusual work for its time, one of very few nudes painted by a Spanish artist. Its early history is something of a puzzle: it was thought to have been acquired by a relative of the Count-Duke of Olivares who was a notorious libertine, but most recently it seems that he had bought it from an art dealer in Madrid in 1652. It shows the goddess Venus, whose face is blurred in a false reflection in a mirror being held by her son Cupid. The theme was common, seen in paintings by Titian and Rubens, with Venus sat upright. Giorgione and others had posed her reclining and facing the viewer, making her pose here unusual. Most other paintings of Venus set her in a landscape: here she rests on luxurious even sensuous fabrics. Venus is one of Velázquez’s relatively few paintings now outside Spain. It was first brought to Britain in 1813, when it was bought by John Morritt, who hung it in his house at Rokeby Park, from which it gained its popular name. It was bought for the National Gallery in London in 1906, and in 1914 was damaged severely by a cleaver wielded by the Suffragette Mary Richardson. Perhaps it is as well that it is the only one of Velázquez’s three documented nudes to have survived. At about the same time that he is thought to have been working on Venus, Velázquez was also busy with one of his most enigmatic paintings, which I will examine in the next article in this series. Wikipedia on the Rokeby Venus. Posted in General, Life, Painting and tagged history, narrative, painting, reflections, Rokeby, Rubens, Titian, Vaccaro, Velázquez. Bookmark the permalink.